In the past decade, almost all U.S. politicians have flocked to social media in order to make themselves seem accessible, especially for a young generation of new voters. 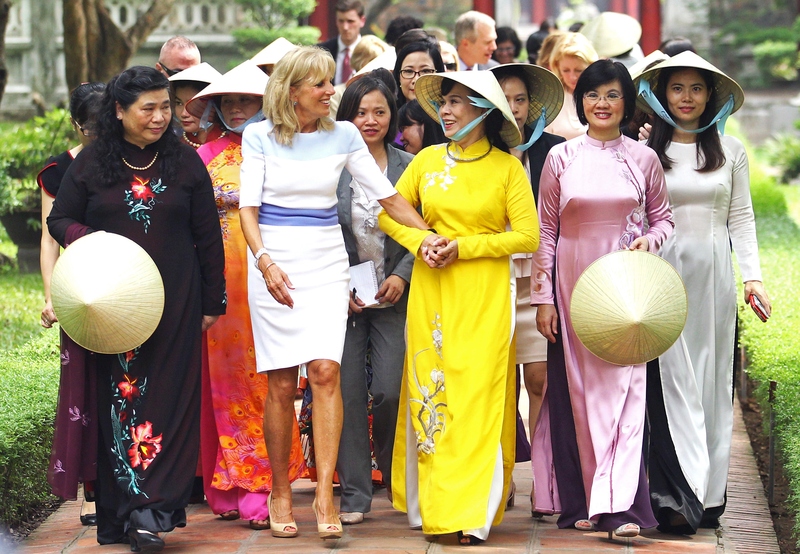 This week, "Second Lady" Jill Biden got an Instagram account to chronicle her journey to Asia. Dr. Biden already has more than 1,800 followers and hundreds of "likes" on her six photos. The account extends her social media reach, which includes a phenomenal parody Twitter account. Biden traveled to Asia in order to promote empowerment and education for women and girls. She and Catherine Russell, U.S. Ambassador-at-Large for Global Women's Issues, will be in the Republic of Korea, Vietnam, and Laos from July 16 to July 22. Biden told female leaders in Vietnam, "If we invest in women and girls, the future of our countries is brighter." Biden has also been posting the highlights of her journey to her actual Twitter account, which she's had since March of 2013. Time will tell whether her Instagram becomes as popular as her parody Twitter account, which has 27,500 followers. As excited as I am by the prospect of an awesome figure such as Biden having an Instagram, I'm even more thrilled at finding a parody account that shares fictional updates from lives of the Second Family. Here are some of the most fantastic Tweets @JillBidenVeep has to offer. The actual Jill Biden tweeted a lot about the women's soccer team, so it's good that her parody account did the same. It's crazy how that works. The White House should actually pull out this argument. Wordplay is the best way to win any political argument. You know, that's actually pretty easy to imagine. Dr. Biden must be a huge fan of The Bachelorette. The parody account tweets about the episodes constantly. I'm waiting to see who @JillBidenVeep supports for the 2016 presidency because I already know her every thought on The Bachelorette candidates. Joe needs a shirt like that to go with his aviators. It's like we have an inside look at the White House. I really hope Trump sees this and thinks it's actually from the Second Lady. Get ready for a serious snub, Jill. This is the politics / Mean Girls crossover I've been waiting for. So pretty much every Republican voter, right? Makes sense. Joe and Jill really need to get their lives together.